Did you ever wonder how to get a really professional-looking finish on your woodworking project? 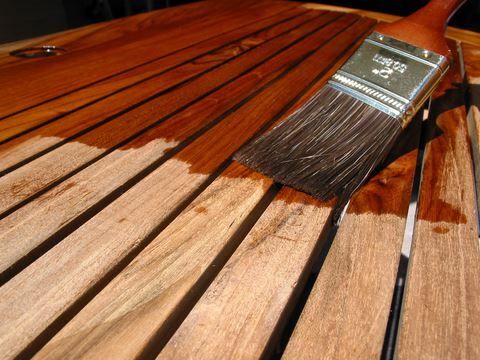 In this hands-on class, you will learn about different types of wood stains and clear finishes and get a chance to experiment with them on a sample board that you can take home and use for future reference. The class is four sessions to allow drying time as you go through all of the steps, from preparing the surface to applying stain and finish, to rubbing out the finish. You will learn how to prepare the surface to help ensure an excellent finish, which stains and finishes work best on different types of solid wood and plywood, and which tools and techniques to use when applying stains and finishes by hand (ie, without spraying). You will also learn which products are compatible with one another — and which ones aren't. Open to beginners but also suitable for experienced woodworkers. "With her professional background, Carol provides you with information that takes you beyond the easy way out of Minwax products at the big box store to the world of waterborne finishes vs alcohol-based or petroleum-based products. You get to see and work with a variety of wood species and grain patterns using penetrating and topical finish products and — what was most exciting — dyes. Most importantly you get the instructions in what not to do as well as what works for you. This is a level of information and hands-on trial that every serious woodwork needs to experience." Instructor: Carol Fiedler Kawaguchi is a professional woodworker who specializes in restoration of antique furniture through her business, C-Saw, on Bainbridge Island. She also makes custom furniture, including the slab coffee table in the Commons at BARN.